Following spring up into the mountains. Creek is full of La Nina’s snow rumbling downstream. Avalanche off Navaho Peak still seven feet deep where it crosses the trail. Along the flank, doug-firs toppled and torn, still locked in January ice. It’s the warmest day of the season so far, above 70 degrees. I am listening to birds, all the warblers and flycatchers, Stellar’s jays, robins, Townsend’s solitaire, and juncos. Inside, I am singing along with the Swainson’s thrush whose song ascends from the tree canopy into the blue sky. There is a hollowness to the notes, an echo that lingers in spite of the rising melody. Summer’s warm breath wafts upslope, bringing the scent of lilies and all sorts of green aliveness. Clambering down off the avalanche, I kick my boot treads into the snow and step onto dirt. The edge is melting and I follow it. Here is where winter and summer meet. Teanaway soil is coarse with decaying serpentinite, and it holds the warmth of the sun. 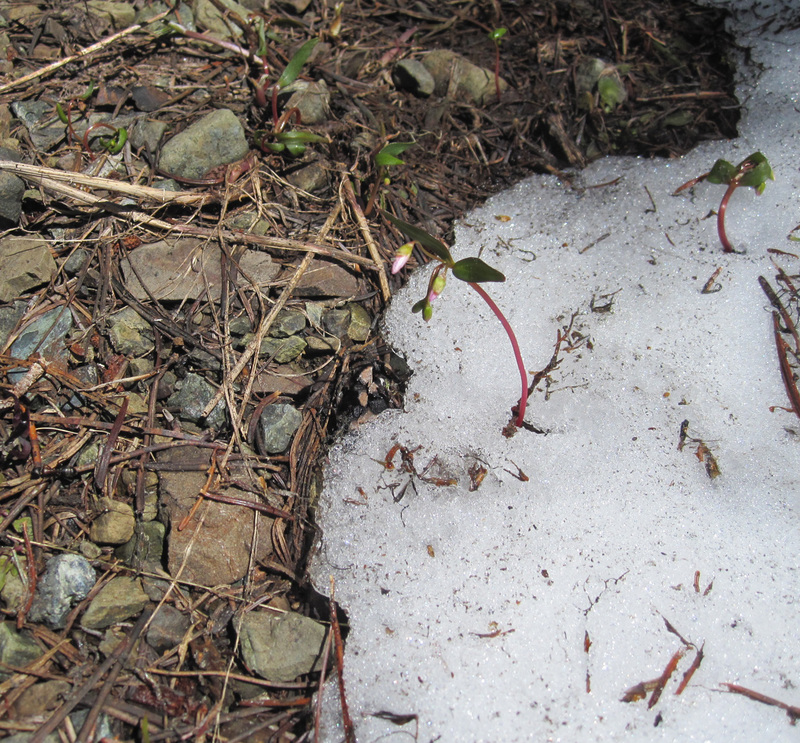 This edge of snow and the spring beauties coming up must change from moment to moment. These are the longest days of the year this next week–15 hours and 55 minutes of sunlight. And with the persistent twilight, there are only about two hours of real darkness. It is the season to grow, to sing and to bloom.